It’s surprisingly easy to tell when people are being real and genuine. You don’t have to be prophetic or even a Christian to discern authenticity in people. It’s a huge value in every culture. The most common and credible criticism of religion is that it causes people to pretend to be something they are not. Jesus is the real root of being comfortable with who we really are. The experience of being forgiven and loved changes everything. We are freed from the games played to earn acceptance in a group. There is something higher than peer pressure to shape our identity. Corporate culture can be as bad, or worse, than religious culture when it comes to shallow people masking their real intentions in order to fit the company mold and protect their position. Transparency – Authentic people know their own strengths and weaknesses. They rely on others to complement their weak areas, and think of it as normal part of being a team. Their willingness to praise the talents and value of other people is sincere and motivating. They communicate the same acceptance and love that they have experienced with Jesus. They don’t fake their feelings, and they are free to lovingly and politely express what everyone in the room is afraid to say. Metron (our personal measure of faith; sphere of influence) – Connected people understand their own calling and direction. This focus on personal purpose gives them direction. They are fulfilled and excited about their role in the Kingdom and world. The perspective is to value other people who cover all those other bases. Their connection with their own hearts is an experience that allows them to help others to connect with their hearts, even though it is usually in a totally different area. Their leadership style helps others to become themselves instead of becoming a follower. Authenticity is promoting others, releasing instead of controlling. It feels like love to have another person welcome you into your own heart’s desires. Intuition – Connected people are free to trust the instincts of their own hearts. They are prone to be originals instead of copies. Creativity comes very naturally through dreaming about the desires of their own hearts. Even in the role of working for others, authentic people carve out responsibilities that they can call their own. This ownership gives rise to productivity and quality in their work and their level of innovation. 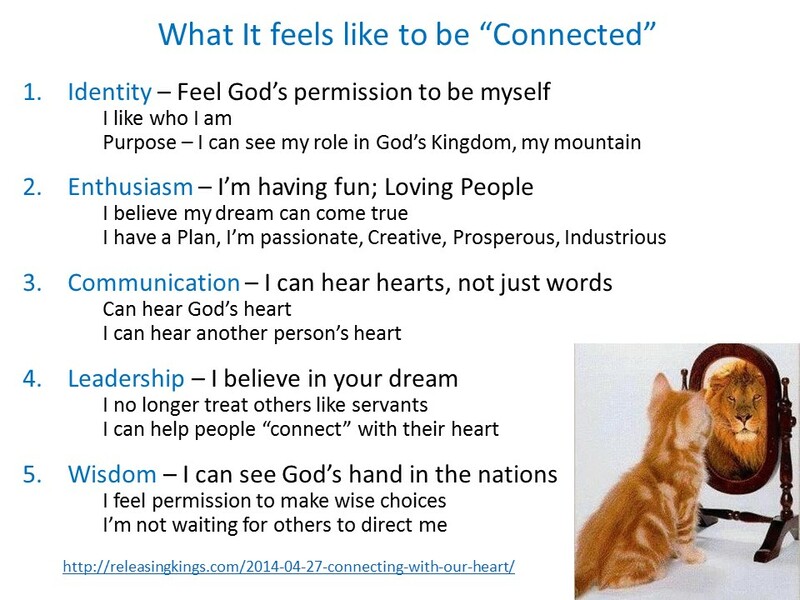 Experiences – Authentic people have their own experience with Jesus’ acceptance and their own experience connecting with the desires of their own heart and God’s heart. Their bases for relationships are on a heart level, and they tend to pull on the desires that God has written on the hearts of those whom they touch. They are not pulled into judging intellectual or theological differences. Their focus is on experiences of the heart, and they can connect past experiences with present behavior and future expectations… without needing to resolve intellectual excuses, rationalizations or theologies. They understand that “mind follows heart” and they simply focus on experiences of the heart as a basis for knowing and loving people. Want to be more authentic? – Taking off the masks that we use to prove our self-worth is a trade. We’re giving up an image of ourselves for the real thing. When we connect with the purpose that God has written in our hearts, we can relax and simply be ourselves. We are each designed by God with our Kingdom assignment in mind. 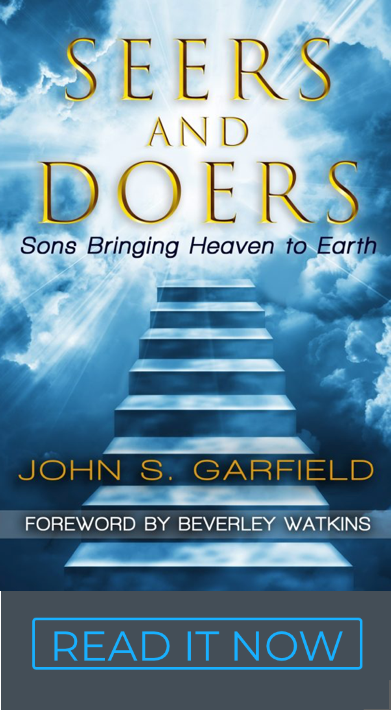 We were designed to both fellowship with, and work with, our Father. He’s not looking for obedience as much as cooperation from an enthusiastic heart. It’s not an enthusiasm we can manufacture. Our hearts have to see the value and role of our calling in the context of Kingdom purpose. We really are here to change the world… our individual contribution really is exciting. We use a heart plan to help make those connections. It’s a Kingdom experience.